$450 raised to support scholarships! Thank you to everyone who purchased a tee shirt from the School of Information Sciences Pop-Up Shop! Your fashion-forward, information-inspired purchases raised $450 for the SIS Student Scholarship fund! 80 tee shirts were sold and they will be delivered in the next two to three weeks! 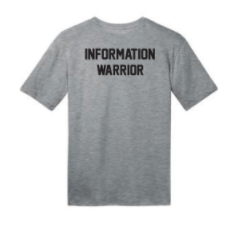 Go Information Warriors!